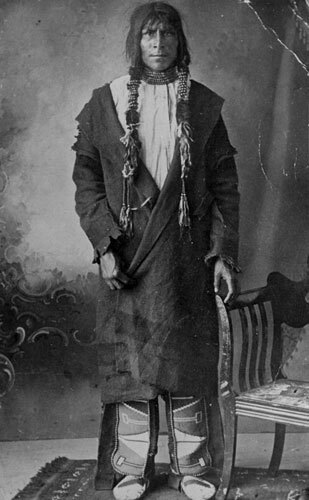 On October 22, 1895, Cree warrior Almighty Voice was arrested for the considerable crime of killing a cow without the right permit. When a white guard japed that workmen were “erecting a scaffold from which you will be hanged next morning” — actually, they were putting up a building — it set off one of the longest and bloodiest manhunts in Saskatchewan history. Almighty Voice took the prospect of having his neck stretched this date seriously enough to break out of prison the night of October 22-23. A week later, a Mountie tried to arrest Almighty Voice and was shot dead for his trouble. From a spurious criminal complaint that likely would not have been pursued, the specter of the gallows had sent Almighty Voice into wanted-outlaw status. For a year and a half he mostly avoided detection, and if the other Cree on his reservation had knowledge of his whereabouts, the government’s $500 reward was not enough to induce them to supply it. In May 1897, Almighty Voice and two fellow-travelers were finally caught in a shootout. The Cree did just fine in this exchange, but two more Mounties and (for some reason) a postmaster were not so lucky. The next day, the Mounties turned cannon on the Indians’ position, finally killing the three of them in the bombardment — or else inducing them to kill themselves. Nineteen months on, seven men were dead on account of our guard’s ill-chosen bit of gallows “humor.” Hardy-har-har. But Almighty Voice remains a legendary name in Saskatchewan.